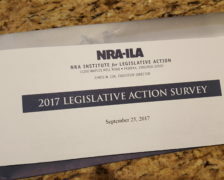 If you are a gun owner in the once, a long time ago, formerly golden state of California, 2016 was a very bad year for us. 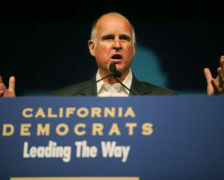 Governor Jerry Brown signed an unprecedented pile of anti-gun bills into law, which has come to be known as “gunmageddon” or “gunpocalypse,” you know, for the children and stuff. On top of that, the ignorant liberal voters just passed Prop 63, which included a plethora of new and some duplicate regulations. If you are like many of us, you might be sitting there scratching your head trying to figure out what to do. That feeling is likely compounded if you are one of the hundreds of thousands of California residents who owns a (formerly) California complaint AR-15 equipped with a bullet button. If you live in a free state and you don’t know what a bullet button is, count yourself lucky. With the initial passage of these laws, there has been a frantic rush on any make or model of AR based rifle by gun owners, and those who desire to be gun owners. While I would never tell folks not to buy a gun, running out in a hurry while demand is high is a good way to pay too much money for a gun. 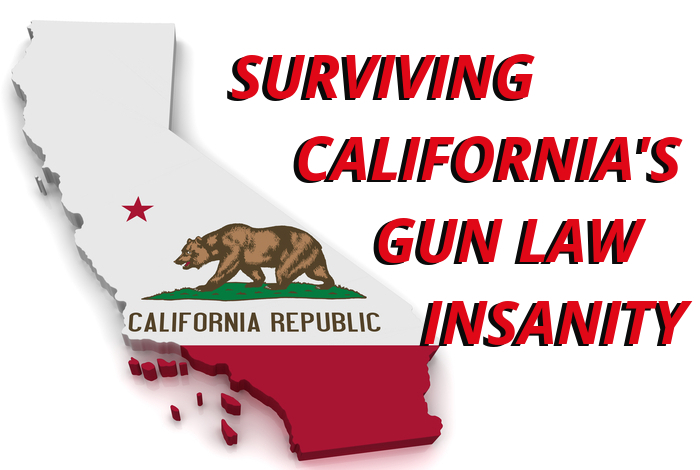 Despite the left’s current wave of attempts to ban AR-15’s from the state, there are already numerous ways to legally sell California compliant AR based rifles, even after the new laws take effect. Fear not, the California legal AR is not dead. Also, for those who currently own a AR in California, and want to remain in legal compliance with the latest batch of unconstitutional laws (until they get overturned), there are ways to make your rifle comply thus eliminating the need to register your rifle. Given options, I will always opt for NOT registering my guns, and thankfully there are legal ways to avoid that. I recently set about testing a number of those options, and I will discuss them each, addressing their pros and cons. 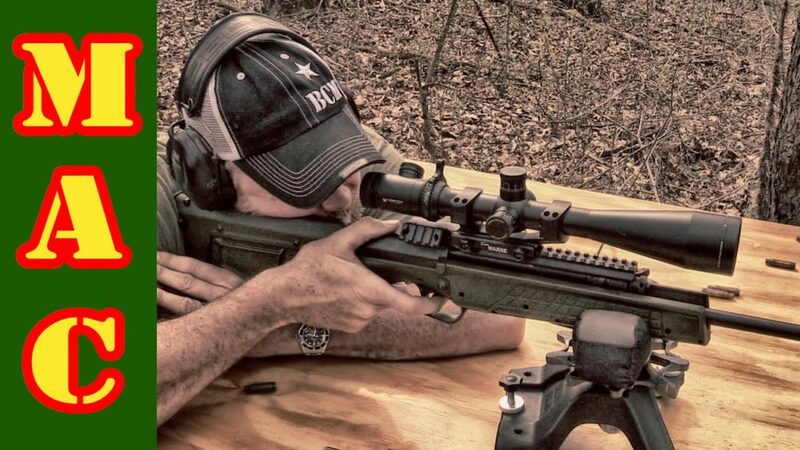 There are two main categories for accomplishing legal compliance with the new laws which should allow you to legally avoid registering your rifle. 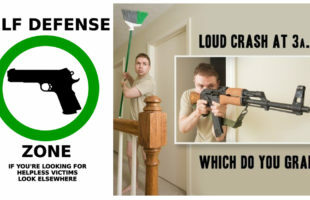 One category is magazine/mag release compliance parts and the other is what has been referred to as “featureless.” The first category, which for discussion sake I will just refer to as “compliance,” involves setting your rifle up so that it requires the receiver to be “disassembled” before the magazine can be removed. On the flip side, going “featureless” allows for the use of a standard magazine release, but you have to remove some of the super ultra deadly and dangerous “features” from the rifle. Some of those features include the pistol grip, a flash hider, and the mega deadly collapsible stock. There are other features, but those are the three most common that need to be addressed. Changing out the flash hider for a brake or comp is a simple matter. That hardest part is determining what muzzle device you want to buy. The cheapest (and highly effective) comp I could find was the DPMS Miculek comp ($40) and there are comps that run several hundred dollars. The choices are nearly limitless. One of my all-time favorite muzzle devices for the AR platform, when you consider compensation, muzzle flash, and loudness is the Battlecomp line. 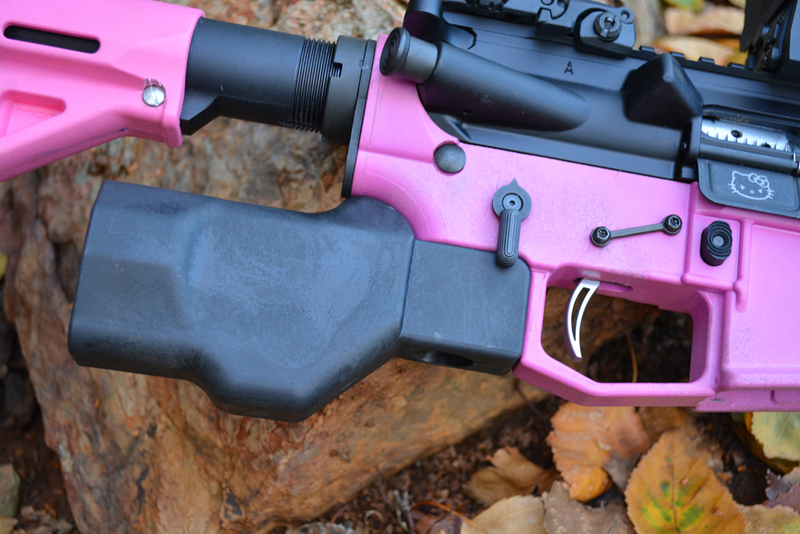 I have several Battlecomps on various rifles, including both my duty gun and my wife’s pink rifle. While not cheap, they are a fantastic product. The collapsible stock is another easily solved problem. 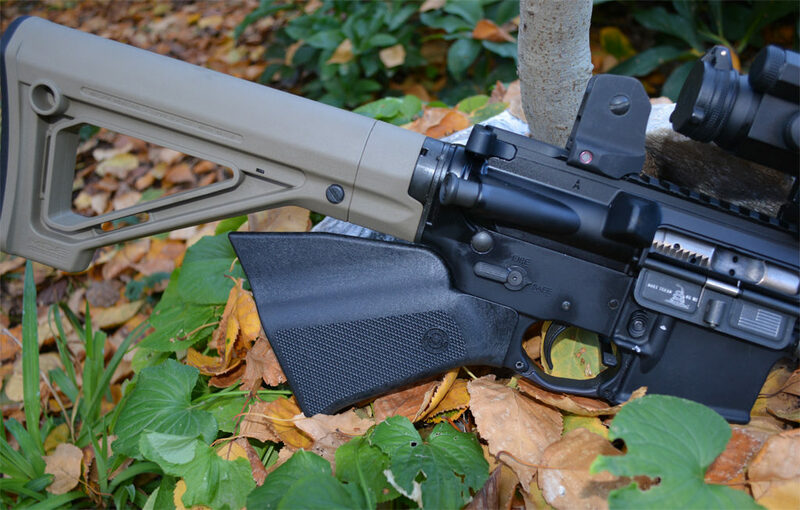 The easiest way to resolve it is to buy a Magpul MOE Fixed Carbine stock ($30). It uses the same buffer tube as the collapsible stock and installs easily. Just make sure you buy the correct model stock for the buffer tube you have (commercial vs. milspec). 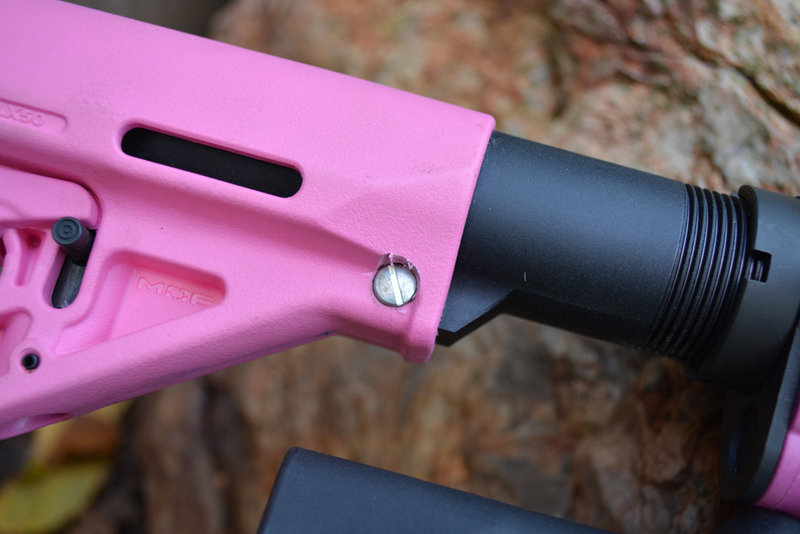 However, in the case of my wife’s rifle (pictured above), it is not available in pink, or for those of you who do not want to spend another $30, you can make your collapsible stock into a fixed stock very easily, and there a multiple videos on the web that show you how. In the case of my wife’s rifle, due to her shorter arms, she needed the stock much shorter. Once the length was determined, I carefully located a spot where the raised portion on the bottom of the buffer tube was solid aluminum, and not one of the adjustment holes, drilled a small hole through the side of the stock and into the side of that raised portion of the buffer tube. I then tapped the hole and installed a screw, thus making the stock no longer collapsible. Later down the road, the screw can be removed and the stock is back to normal function. As previously stated, this category include special parts that can be installed on a standard AR which make it so that the receiver has to be disassembled before the magazine can be removed. There are several different takes on this and I have tested two products that fall into this category. 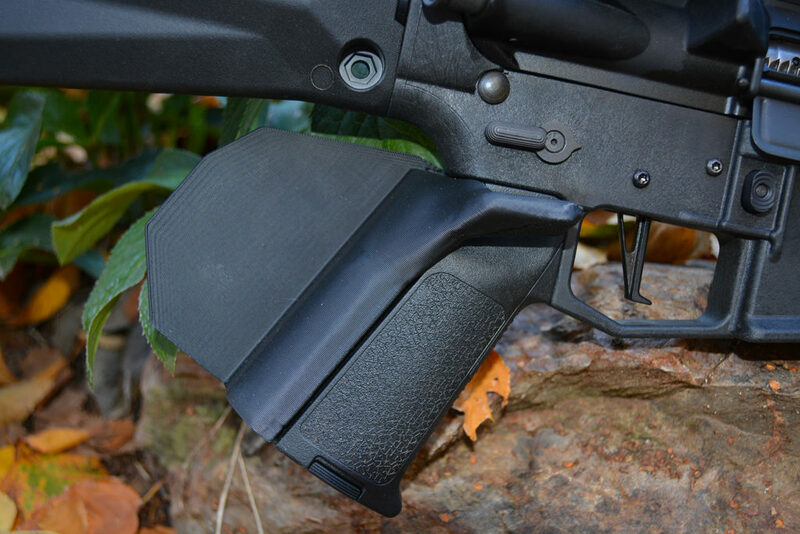 AR MagLock – The AR MagLock ($54.95) is a replacement magazine release that comes with everything needed for installation. You remove the stock mag release, install the AR MagLock (ARML) and once installed, the magazine release will only function with the top half of the receiver opened, thus in theory complying with the new law. There has been no ruling (to my knowledge) by the CA DOJ yet, but in my dumb street cop opinion, it appears to meet all the requirements set forth in the new law. 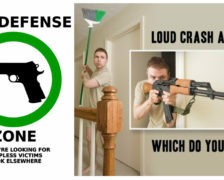 The pros are you get to keep your normal pistol grip, collapsible stock and need not be concerned with your muzzle device. The con I found was minor, and could easily be countered by training, but it was an issue for me. When the bolt locks open on an empty mag, you must first drop the bolt before you can proceed with your reload. For me, that was a constant problem as it runs counter all my training and practice with my duty rifle. If you trained with this enough, you could get past that issue and get reasonably fast mag changes. Patriot Mag Release – The Patriot Mag Release ($44.95) is produced by the inventor of the original bullet button, and is sold at bulletbutton.com. While I have no hands on experience with this product, I do know that it functions the same as the ARML, but differs how it is installed. The biggest difference between the Patriot and the ARML is that once installed, the ARML still has an hex (Allen) bolt that is accessible while the Patriot comes with a plug that is hammered in place covering any and all screw heads. This could be a sticking point (for the ARML) when the product is examined by the CA DOJ. At this point, the Patriot has also not yet been approved by the CA DOJ, but once again, this stupid street cop thinks it complies with the latest laws. While I have no hands on experience with this product, I suspect it would have the same pros and cons I listed above for the AR MagLock. 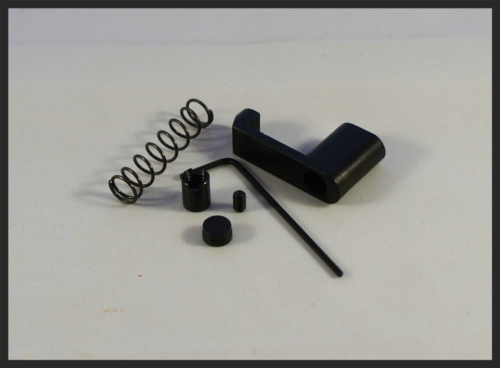 Franklin Armory DFM – The Franklin Armory DFM line consists of two products for the AR-15, a DFM magazine ($24.99) and a DFM bolt catch ($19.99). You can buy just the magazine, or you can install the two parts in conjunction. Installation is simple, but does require removing/replacing the bolt catch in order to insert the DFM magazine in the lower. With both the DFM bolt catch and the DFM mag(s), reloads are accomplished by unpinning the rear takedown pin on the upper receiver, pivoting the upper open, pressing the standard mag release and removing the mag from the top of the mag well. Based on the design of the magazine, you cannot remove or insert the DFM mag from the bottom of the mag well. If you opt to buy just the magazine, realize that in order to reload the gun, you will have to not only pivot open the upper receiver, but you will then have to reload the magazine while it is still in the lower receiver. If it is only a target gun used on a static range, that might be an acceptable option for you. The pros for this are the same as the AR MagLock and the Patriot Mag Release. 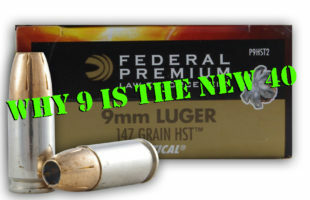 The cons are that any CA legal 10 round mags you may already own are now useless in this gun. 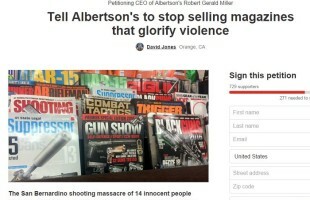 With this system, you must use their magazine or you risk serious legal issues, which I note below. IMPORTANT LEGAL NOTE: If you buy both the DFM bolt catch and the magazine(s), legally speaking as a cop who doesn’t want to see you get jammed up, I must warn you to always keep a DFM magazine in the gun, even when empty or not in use. 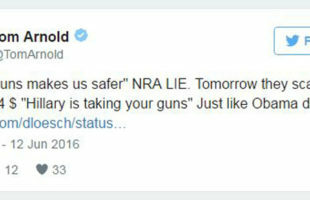 If you remove the DFM mag (which is possible when you use the DFM bolt catch), and then close the upper receiver, legally speaking you will have just created an “unregistered assault weapon” and if you were to run into an overzealous cop who finds your rifle in that condition, you could find yourself with pending felony charges and your gun could be occupying space in a police property warehouse. The featureless category has some pros and cons as a category. While going featureless does indeed allow for use of a standard magazine release (no tools needed), sadly they lack the cosmetic appeal of the guns employing the compliance parts. While some featureless guns do not look significantly different from a standard AR, some of them border on horrendous in appearance. If cosmetics are not that important to you, and functionality is, this just might be the route for you. I have tested a number of featureless grips/stocks and found all of them to have their ups and downs. While I will discuss each of them below, all of them were tested in one video which will be included at the end. Also, please realize that while I am only discussing the grips or stocks at this point, there is more to making an AR into a featureless gun than just installing the parts I discuss. If you want to know what needs to be done, the best resource I have found to tell you everything you need to know is this flowchart that was put together by the folks at CalGuns. 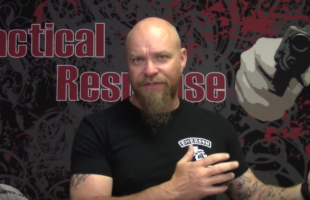 Monsterman Grip – The Monsterman Grip (available for both AR and AK family rifles) is a simple solution to a potentially difficult problem, and it is also one of the more cosmetically appealing solutions. When used in conjunction with a standard A2 fixed stock on an AR, it looks pretty decent. With the addition of an ambi safety (highly recommended), functionality is also not significantly different from a standard AR rifle. The product is well made and is quite solid feeling. While it does not offer storage that many standard pistol grips do, it does keep your hand in a reasonably ergonomic position while shooting. The only negative I found with it was due to the grip angle and the smooth finish of the front strap portion of the grip, my hand tended to wander back and forth on the grip while shooting, which caused me to have some inconsistencies in where my hand was on the trigger, which translated into slightly different trigger pull lengths making it more difficult (for me) to have consistent double taps. I must stress though, that issue could just have been me. Exile Machine Backfin – The Exile Machine Backfin ($24.99) is a product that is designed to be installed on a Magpul MIAD grip. 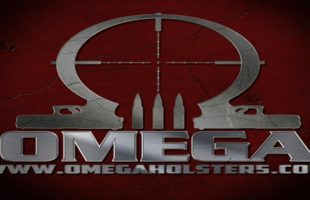 It replaces the backstrap of the grip and includes a large back fin which prevents the shooter from wrapping their hand around the grip, thus legally converting the pistol grip into something that does not meet the legal definition of a pistol grip. The upside of the Backfin, when compared to Kydex grip wraps that accomplish the same goal, is that the Backfin provides a nice ledge on which to rest your thumb, and the Backfin is available in left and right hand versions. Again, an ambi safety is highly recommended. This product was my second favorite option tested, and is my option of choice for my precision riles. Recently, they also released a deluxe version of the Backfin ($49.99) for both the Magpul MIAD grip as well as the BCM Mod 2 grip. There is even an AK version ($54.99) designed to fit the CAA UPG AK grip. Exile Machine Hammerhead Grip – The Exile Machine Hammerhead ($29.99) is a dual purpose product. 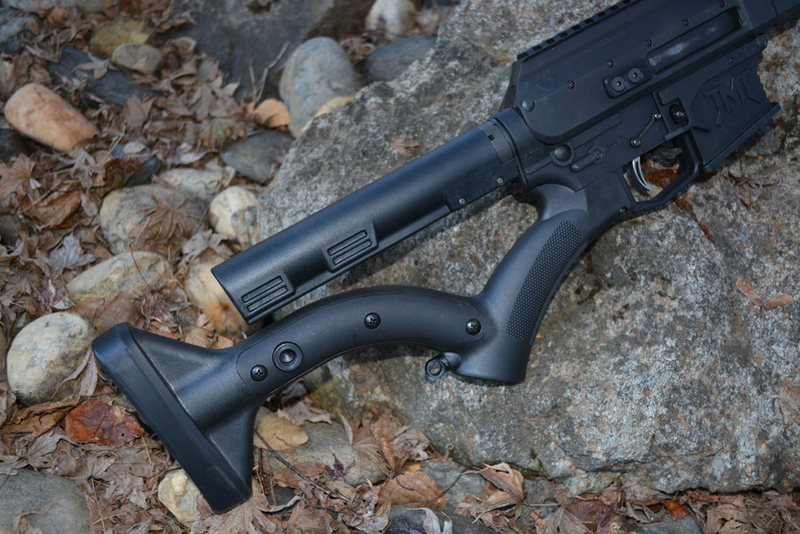 It can function as a standalone grip, or it can function as a stock mount (for NY compliance). While far from the best looking grip option, it is surprisingly comfortable when shooting. As with the other previous options, I highly recommend installing an ambi safety. Thordsen Customs FRS-15 – The Thordsen Customs FRS-15 stock ($110-144 depending on model) is by far the least normal looking option I tested. In fact, in my opinion, it is downright ugly. That said, this is by far the most comfortable, best handling option that I used. I can run a gun wearing the FRS-15 just like I can a standard AR with a normal pistol grip and regular mag release. All of the controls are easily accessible, the gun shoulders well and the cheek weld feels normal. My only complaint is the lack of options for length of pull. While I have very long monkey arms, I still found myself wishing for a shorter length of pull. 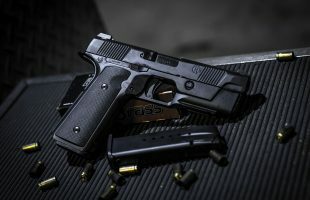 While this is indeed one of the more expensive options tested, you must also consider that if you choose this product, it is a 2-fer essentially as it is both the pistol grip and the stock all in one. A short while ago, I had two friends with different experience levels help me on a video in which we shot all of the above rifles. We compared them and made a few notes which we compared and then I talked about the conclusions at the end of the video. That video is below. There are also other options out there for folks like me, who find themselves living behind enemy lines. If you really want an AR pattern rifle, but don’t want to bother with any of the above options, there is actually a pump action AR-15 made by Troy. Eric over at IraqVeteran8888 ran one through its paces not too long ago. Along the same lines as that, there are also one or two pump action AKs on the market, but I know very little about them. Lastly, and only because it is still not available to the public yet, Kel-Tec has been working on another new bullpup, but this one is designed specifically for the California market and is a featureless bullpup. 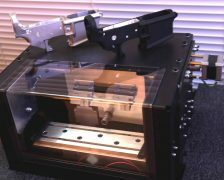 The Kel-Tec RDB-C, which is currently just vaporware, is actually in the works. In fact, a number of prototypes have made their way into the hands of a number of people, one of which was Tim from Military Arms Channel. I’m hoping to possibly get my hands on one for review as they get closer to production. 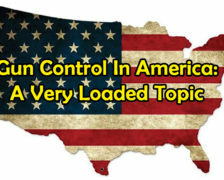 Just as an end note, as a California cop, just like most cops nationwide, I realize that all of these asinine gun control laws the liberal politicians and mindless voters keep passing do absolutely nothing to prevent “gun violence” (I always put that in quotes because it is the person who is violent, the gun is just their tool, and almost always obtained illegally by the violent person using it) and do nothing to keep anyone safe. 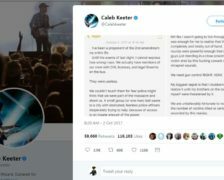 I realize that only an idiot would think these latest laws are going to prevent a person, who is intent on killing others, from obtaining a gun. I realize that all of these laws do nothing to criminals and only prevent law abiding citizens from exercising their constitutionally guaranteed rights. BUT I also realize that because of the recent election, there is still hope for the Supreme Court and that it is possible that we might be able to fight all of these infringements and get these illegal laws repealed. While I am currently dismayed at the ridiculous hoops we are being forced to jump through, I am hopeful for the future. I realize there are other options out there and I may not have addressed them all. Feel free to list others you are aware of in the comments below. Additionally, if you are the rep for a company making a California compliance product that you would like to have reviewed, please feel free to contact me. I am always happy to examine all the possible ways for folks to stay in compliance with our moronic laws.